An improved Hawker Hart bomber defined by Specification G.7/34, was purchased by RAF as interim aircraft while more modern monoplane bombers such as the Fairey Battle were still in development. Structural elements were a mixture of steel and duralumin with the wings being fabric covered while the main differences compared to the earlier Hart was a new powerplant, (the Rolls Royce Kestrel V) and the inclusion of refinements from the earlier derivatives such as the cut-down rear cockpit developed for the Demon. The prototype (K2915) was constructed very rapidly due to Hawker's development work for other proposals, and made its first flight on September 12, 1934. A variety of changes were subsequently incorporated ("ram's horn" manifolds, Fairy-Reed metal propeller and engine improvements) with the first production Hind (K4636) flown on 4 September 1935. The Hind went into service in November 1935 and eventually equipped 20 RAF bomber squadrons. A number were also sold to foreign customers including Afghanistan, the Irish Free State, Latvia, Persia (Iran), Portugal, South Africa, Switzerland, and Yugoslavia. By 1937, the Hind was being phased out of frontline service, replaced by the Fairey Battle and Bristol Blenheim, and with many of the Auxiliary Air Force squadrons changing role to fighter or maritime patrol units. 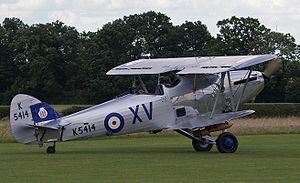 At the outbreak of the Second World War 613 Squadron remained retained the Hind in the Army co-operation role before re-equipping the Hawker Hector in November 1939. The Hind found a new career in 1938 as a training aircraft representing the next step up from basic training on Tiger Moths. It continued in use as an intermediate trainer during the Second World War. Hind trainers were also operated by Canada and New Zealand. In 1941, Hinds flew combat missions in their original role as light bombers. South African Hinds were employed against Italian forces in Kenya, Yugoslav Hinds were used against the Germans and Italians while Iranian Hinds were used briefly when invading Allied British and Soviet contingents attacked Iran. Hind Mk I Two-seat light bomber aircraft for the RAF, powered by a 477-kW (640-hp) Rolls-Royce Kestrel piston engine. Afghan Hind Similar to the Hind Mk I, four aircraft fitted with Roll-Royce Kestrel V engines, plus another four aircraft fitted with Kestrel UDR engines; eight built for Afghanistan. Latvian Hind Two-seat training aircraft, powered by a Bristol Mercury IX radial piston engine; three built for Latvia. Persian Hind Modified version of the Hind Mk I, powered by a Bristol Mercury VIII radial piston engine; 35 built for Persia. Portuguese Hind Similar to the Hind Mk I, two aircraft built as bombers, two aircraft built as trainers; four built for Portugal. Swiss Hind Two-seat unarmed communications aircraft; one built for Switzerland. Yugoslav Hind Modified version of the Hind Mk I, two aircraft fitted with Rolls-Royce Kestrel XVI piston engines, one aircraft fitted with a Gnome-Rhone Mistral engine; three built for Yugoslavia. An airworthy ex-Afghan Hind flies with the Shuttleworth Collection. Others are on display at the RAF Museum in Hendon and the Canada Aviation Museum. Several former Royal New Zealand Air Force Hinds are being restored/reconstructed by the Subritzky family / The Classic Aircraft Collection at Dairy Flat near Auckland, of which at least NZ1517/K6687, and NZ1535/K6721 are under restoration to airworthy condition; substantial parts are also held for NZ1518/K6717, NZ1528/L7184, NZ1544/K6810 and NZ1554/K5465. Another former RNZAF Hind is being restored for static display at MoTaT. The remains of other Hinds were recently located in Afghanistan.